The upper floor of the Mount Allison administration building rang with songs, chants and laughter today after more than 50 students moved in seeking a face-to-face meeting with university president Robert Campbell. A couple of hours later the students got their hour-long meeting, but afterwards many shed tears and expressed bitter disappointment. 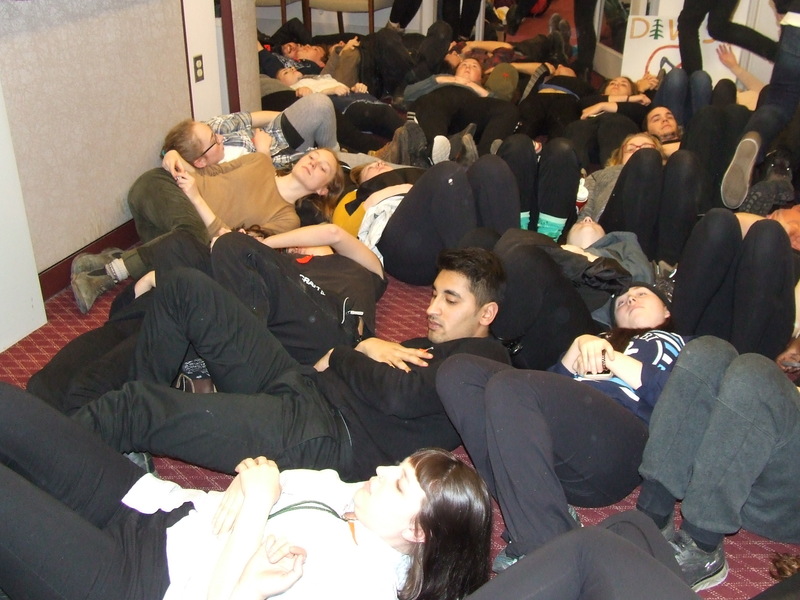 As Campbell left the meeting, they staged a “die-in” to represent the victims of oil and gas exploitation. 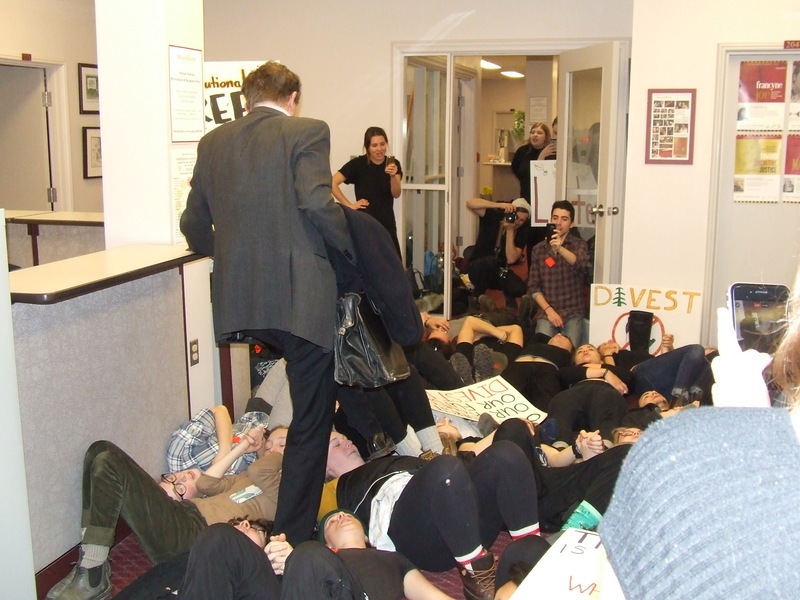 Some agreed to remain in Centennial Hall all night as part of their four-year campaign to persuade the university to sever its investment ties with the fossil fuel industry. However, the students decided later to leave the building at 6 p.m. The five hour occupation of the administration building was an extension of the “camp-out” in the academic quadrangle that began on Monday when organizers for the group Divest MTA pitched tents and started sleeping there in snow, rain and sub-zero temperatures. On Tuesday, they held a teach-in where members of faculty gave them enthusiastic support while administrators ignored them talking to the media instead. Then, according to a Divest MTA news release, the students learned of an e-mail that Campbell had sent to the university’s highest governing body, its Board of Regents. “Mount Allison president Dr. Robert Campbell explicitly asserted that the University had no plans to engage with Divest MTA directly or negotiate the camp-out’s presence,” the news release said. Today, the students moved into Centennial Hall seeking to meet with Campbell. When the meeting finally happened, Divest MTA leaders asked that the door remain open so all of the students sitting outside the room could hear what was said. As the students listened in the outer room, Divest MTA leaders Tina Oh and Alex Lepianka asked Campbell to begin the process of shedding endowment fund investments in the fossil fuel industry. They called on the Mt. A president to recommend such divestment to the university’s Board of Regents. “It’s not my role,” Campbell answered. “It is your role,” Oh responded. “As president of [this] public institution, students get to decide what is your responsibility,” she added. “Thank you for being so passionate about it, but I disagree,” Campbell said, adding that as president, he must listen to all constituencies, including students, faculty, alumni and donors. He noted that students are represented on the university’s governing bodies and have a voice in their decisions. Lepianka said the process is undemocratic adding that after four years of campaigning, students have gotten nowhere on the issue of severing the university’s ties with oil and gas. Both Oh and Lepianka argued that as president, Campbell has a moral responsibility to sever the university’s ties to fossil fuels when the industry threatens the lives of so many, including the indigenous peoples the university claims to respect. “If you are doing nothing, then you are doing evil work,” Oh added. “I don’t agree with your language or your characterization,” Campbell said. As the meeting ended, Campbell asked the students to leave the administration building. Then, Campbell gingerly stepped over their “dead” bodies as he made his way to teach a scheduled class. “Robert Campbell has just stepped on his students as he left the building,” said Divest MTA organizer Naomi Goldberg. In the aftermath of the meeting, several students wept. Naia Noyes-West said that students, unlike older people, were born into a world where the devastating realities of climate change already existed — realities that will weigh heavily on them and future generations. She added that as students at Mt. A, they were learning about such issues from their professors. This entry was posted in Environment, Indigenous affairs, Mount Allison University and tagged Alex Lepianka, Divest MTA, Kim Meade, Naia Noyes-West, Naomi Goldberg, Robert Campbell, Robert Inglis, Tina Oh. Bookmark the permalink. If any of the pro-“divesting” students are reading this, please explain how you feel that removing university investments from an entire sector achieves anything positive either for society in general or for the university, because I’m not seeing it. The only effect I see is a removal of profit from endowment funds, i.e., smaller scholarships, etc. I can grasp arguments against specific projects or practices (say, fracking in NB or unfair labour practices of a specific company), but I don’t get arguments against the entire hydrocarbons sector, unless there’s a proposed realistic alternative that can replace it. In either case, I’d suggest that the efforts would best be applied against the regulatory framework that permits the problematic behaviour. An investment “ban”, regardless of how one feels about the sector, is akin to bailing water out of a leaky boat without plugging the holes: it achieves nothing other than harming those implementing it. The alternative investment is in the Renewables sector which is growing quickly and will continue to do so. Leading a life of “same old same old” is a life that isn’t reading about where this world is going . If the “Renewables sector” is a better investment opportunity, then on *that* basis, it would be a good choice and that would be that. But (a) that’s a big IF and (b) that’s not the point that’s being made here. I would say that the “Renewables sector” is, at this point, highly speculative. Not all of it, of course – buying into a hydro-generation project, for example, is a safe investment, just like the hydrocarbons industry is. Well-established sectors, like the oil industry, are proven money-makers that provide fairly predictible and reasonable returns on investment. They’re more appropriate of an investment for money like endowment funds than speculative investments. View it this way: would you like to be a student on a scholarship, and to be told that “We’ve invested the principal from which your scholarship is paid into the Renewables sector. Hopefully, it works out well and you’ll get a bigger scholarship next year, but if it doesn’t, you’d better start looking for a job to pay your tuition!” or would you rather have that money invested in something that brings a bit more certainty, while still keeping returns high enough to pay a useful level of tuition assistance? Because that, in the end, is the real question. Remember that in the end, when the real world and ideology collide, the real world wins, every time. Not always right away and not always obviously, but in the very long term, that’s always what happens. This is why I’m suggesting that those really wanting to do something about the world’s dependence on hydrocarbons have only one real option: finding something better. In that case, the oil industry will wither away very quickly, but until then, it will continue doing nicely. I too feel sympathy regarding the entire situation. As someone who values knowledge, believes in the power of knowledge, and has invested in knowledge, I take no pleasure in watching the president of an academic institution refuse to make a simple recommendation (based on what his students learn in his institution) to those who decide how to invest his students’ money. However, the fact of the matter is, the fossil fuels industry lives off investments, many of which come from universities. The success of this tactic can be seen in divest movements throughout the world, as well as in recent market fluctuations. And it is quite the dilemma when I must choose between learning about sustainability and investing in sustainability. So long as the leaders of academic institutions insist on investing their students’ money in fossil fuels, I as a student, am forced to invest in industries which steal valuable resources (land, air, and water) from my future, in the very act of trying to learn how to save those resources. Wark the CBC is strong in you. Although you write very elegantly, I am not sure I can follow your logic. Correction: This money is not just students’ money. I work at Mount A. It is none of my business how the administration has chosen to invest its funds. I can see myself taking up the cause only if Mount A is investing in weapon industry and trying to increase the demand for this product. I salute our President’s leadership in dealing with this situation. In caring so much about global issues, it is perhaps easy to become disconnected from the economic hardship just around the corner. If Mount Allison “powers that be” were prepared to accept the recommendations of this group, many in this country would consider it a very progressive move. So far, no university in Canada has taken this step. There is an opportunity to be the first! This might mean that progressive- thinking students from other universities might decide to transfer to Mount Allison, thus bolstering the sagging enrollment! It is the job of investment brokers to choose investments for their clients based on their directives. There are many lucrative alternatives to fossil fuels, which really is not such a good or sustainable investment anymore. Actually it is becoming very expensive to each of us Canadians in subsidies and environmental degradation. It does make very good sense to now invest and support the development of renewable energy. It is the legacy to a future for our generations to come.